HomeNewsExclusive Premiere: This Way North’s New Single and Video! Exclusive Premiere: This Way North’s New Single and Video! Recorded over two stints in Toronto, Canada during 2016 and 2017 with producer Derek Downham (Eagles of Death Metal, Broken Social Scene, Holy F*ck), EP Vol. 2 is a six-song collection that showcases the band’s evolution from the rootsy rock of 2016’s EP Vol. 1, to a new realm of luscious, groove-laden alt-pop and synth-rock. 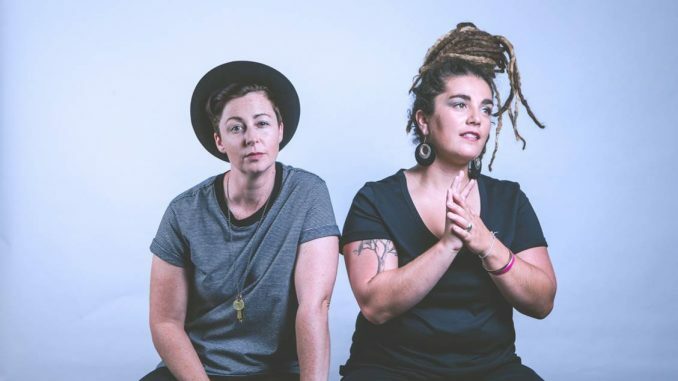 Absorbed in the expansive energy of drummer/vocalist Cat Leahy and guitarist/vocalist Leisha Jungalwalla’s performances, it’s easy to forget that This Way North is a two-piece band. It’s a unique fullness of sound that follows the pair effortlessly from the studio to the stage. The release follows a bustling 2017 during which the duo played over 120 live shows across Australia, New Zealand and Canada including the Dawson City Music Festival in the Yukon, just 200kms south of the Artic Circle; a spot at Wide Open Space festival, in the Northern Territory’s sweeping central desert; and a trip to stunning Vancouver Island for Atmosphere Gathering. The driving cross-rhythms and harmony-rich vocals of lead single ‘Nothing to Say‘ sets the tone for the EP. The beautifully arranged and sometimes ethereal yet upbeat, melodic gem captures the essence of wanting to just be still and unwind. Written about waking up in the morning and getting out of your head. Sometimes we spend too much time talking about problems when we just need to be still and move through them. Track ‘Head Above Water’ stands out with its mid-noughties-tinged guitar riffs, sun-drenched lyrics and a rolling drone that begs to carry you downstream with it, while ‘Make It Work’ dances between funk-infused call-and-response and the kind of sing-a-long refrain that’s been known to fill arenas. Second single ‘Pressure is dirty’, 80s inspired pop at its best, complete with palm-muted guitar stabs and a resplendent, reverb-drenched bridge that picks you up before the chorus drops. It’s an EP that perfectly encapsulates what This Way North is all about: great music, great company and seriously fun times. The idea of home is a constantly-evolving notion for Cat and Leisha, having both experienced country Victorian childhoods; stints in the big smoke of Melbourne; around-the-globe adventures both solo and together; and, now, the nomadic life on the road with no fixed address. But one thing is evident in hearing their records and watching them perform: their home is on the stage. Whether in a local dive bar or at a national festival. This Way North plays with more passion and energy than a 10-piece band, and it’s a euphoria that’s contagious. Big, rhythmic, spacious and saturated with summer, EP Vol. 2 will have you moving in the blink of a drumbeat, whether you want to or not. The release of EP Vol. 2 will be followed by a national Australian tour. This Way North will spend March playing all over Western Australia before dropping by South Australia, Victoria, New South Wales and Queensland between April and May.